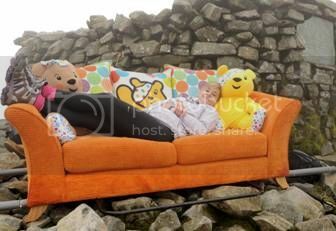 With 44 years experience in the furniture making business when DFS decided to set a £1 million fundraising target for the BBC’s Children in Need Appeal they decided one of their projects would be for their employees to scale the highest mountains in each of the UK countries. Three teams comprising of 34 employees in all climbed Ben Nevis, Snowdon and Scafell Pike climbing over 3000 metres between them, and reaching the summits at the same time. The feat to carry a combined 75kg to the summits hoped to raise £5000 in sponsorship. Climbing the mountains is done every day by all manner of people, but not many people carry a two seater sofa along with them – although a number who reach the summit would probably be grateful for a comfortable sit down at the top! One of the team who climbed Snowdon, Phil Johnson said ‘This has been a real feat, and the team has worked well to overcome challenges along the way. When we reached the summit we felt really proud, not only to have climbed the peak, but to have done it carry a sofa’. Children in Need spokesman said ‘This is an amazing challenge and certainly no mean feat. We are delighted with what the team has achieved. It is fantastic to have DFS on board raising money for BBC Children in Need. Their support will make a huge difference to the lives of disadvantaged children and young people across the UK’. Only one question that MountainWalk has – did they leave the sofas at the summits for other weary climbers to make use of?? This entry was posted in Three Peaks Challenge by . Bookmark the permalink.